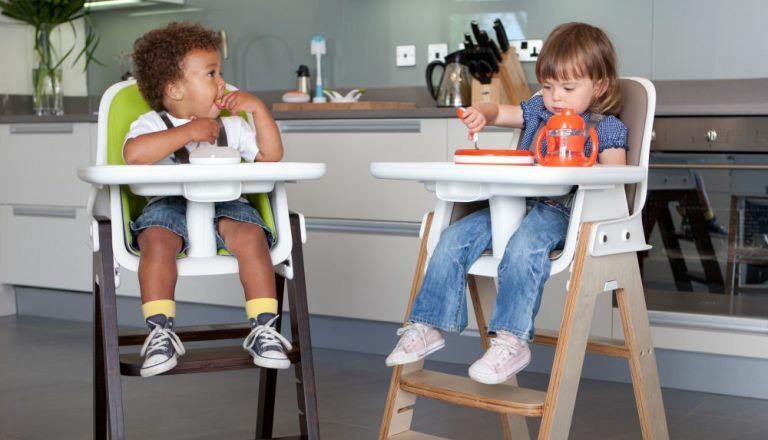 From dinner with the family to eating out; we’ve picked the best high chairs that make meal time with the kids a piece of cake! Is sorting the kids' dinner more like feeding time at the zoo? Then you need to invest in a high chair that’s going to keep them sat still at the table. A good high chair will support your tot, teaching them how to sit up straight while making them feel like one of the adults. You also may want to consider investing in a booster that can transform a normal chair into a high chair, which is great for eating out in restaurants and making your child feel like one of the grown-ups. There are a range of different high chairs on the market, depending on where and when you plan to use it. If you’re going on a family day out, you can make sure lunchtime doesn’t end in tears (or a food fight) with a portable high chair that is lightweight and compact. High-chairs are more than what they used to be, and let’s face it, we’d all rather make family dinners as stress-free as possible, without the added hassle of having to clear up the aftermath of a spaghetti tsunami. Look out for chairs with handy elements such as removable legs and ones that can be completely flatpacked for easy transportation. If you don’t want a high chair to stick out like a sore thumb in your home then you can get some beautifully designed ones that will match the decor (although these tend to be rather pricey) and extremely minimalist ones that don’t require excessive cleaning. We’ve rounded up the best high chairs for all eventualities, so take a seat and see which one you like! At just £14 you can’t go wrong with the Antilop High Chair from Ikea. It’s safe, sturdy and comfortable, as well as incredibly easy to dismantle, clean and store with it’s removable legs. This fuss-free chair may not have all the luxury padding and straps you think you need, but it’s basic plastic design is extremely low maintenance and does the job incredibly well. You can even afford to get a spare for Grandma’s house, too (sorry Grandma). This chair will literally become part of the furniture with its adjustable frame that lasts a childhood. This chair is pricey and does require some accessories depending on the age of your child, buy unlike the traditional high chair, this design is one that will literally last a lifetime. It is adjustable so that your child can grow with it and learn independence at the dinner table. Not only that, but it has a very minimalist design which doesn’t look like a children’s high chair at all, but is extremely functional nonetheless. Forget lugging around massive contraptions or sitting your child in a dirty restaurant high chair. This lightweight and portable ‘clip on’ chair is one of the best high chairs for eating out. Whether it’s a picnic bench in the park or a table in a restaurant, this high chair simply clamps onto any surface and is surprisingly sturdy for children aged up to 2 years, with a a max weight of 15kg. It comes in a handy carry case and can fit in handbags, backpacks and changing bags. Style and practicality rarely go hand in hand when it comes to high chair, but we think the OXO Tot Sprout Highchair is on to something. If you want something that’s going to look good in your kitchen, as well as give your child the support they need, then this is the high chair for you. It features a 5-point safety harness, removable cushions for easy cleaning, and can be adjusted without the need for tools meaning no tears all round. Another happy union of form and function, the Nuna Zaaz looks good and does good. If you liked the idea of the IKEA chair that’s super easy to clean, but want more luxury for your tot then this chair has it all (and a price tag to go with it). This chair features a removable tray table that is dishwasher safe and the air-foam cushion is super comfy with a sleek design that means crumbs have nowhere to hide.